Nose: A minerally, mossy note straight off the top and some farmy peat below that. Wet stones and a very mild sweetness. No real fruit to speak of. Wait, here are some apples and apple peels. Gets maltier too as it sits. Let’s give it some time. With time the minerally peat gets stronger and there’s something reminiscent of motor oil about it too; and there’s some lime too now. No real change with water. Palate: Thin mouthfeel and a somewhat blank start but then the lime arrives along with that minerally/oily thing and begins to intensify picking up some sweetness as it goes. On the second sip there’s more from the get-go and there’s more bitterness and a light soapiness too (but not really offensive). More soot too with subsequent sips but the soapy note expands with time. Okay, this is weird: much later I’m beginning to get some musky, almost tropical fruit notes. I was hoping water might help me pick the fruit more clearly but no luck. Finish: Medium. The lime gets stronger before fading out and the soapiness is most apparent at the end. Comments: This was really rather reminiscent of the 1980 Dallas Dhu I reviewed a while ago though not quite as austere. That unexpected appearance of fruit on the palate was particularly nice. On the whole, this is not outgoing whisky but it’s a nice break from the robust peat and exuberant fruit that is my usual fare. Still, it’s a little thin at 43% and I could have done without that soapy/bitter thing. Who knows maybe it was more pronounced at cask strength but I wish they’d bottled it at 46% for the UCF line and given it a little more body. Best not to add any more water. I think this might still be around. I’d get it south of $50. This entry was posted in Fettercairn, Signatory, Whisky by Bottler. Bookmark the permalink. I started by disliking this bottle but came around after a few months. (Same happened with my Glen Scotia 12yo). “Uniquely soapy finish” is all I wrote initially. 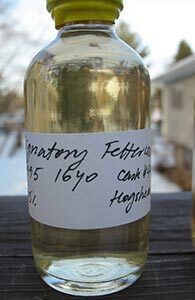 My later report was much kinder: “Farmy notes combined with malt; very satisfying; something metallic and short in the finish that diminishes it for me slightly; overall, a very interesting bottle.” I have learned to appreciate the weird savory notes of the likes of Fettercairn, Tobermory, and Glen Scotia, enough so that I’m seeking these distilleries. As for Fettercairn, the soap could actually be just that: soap!